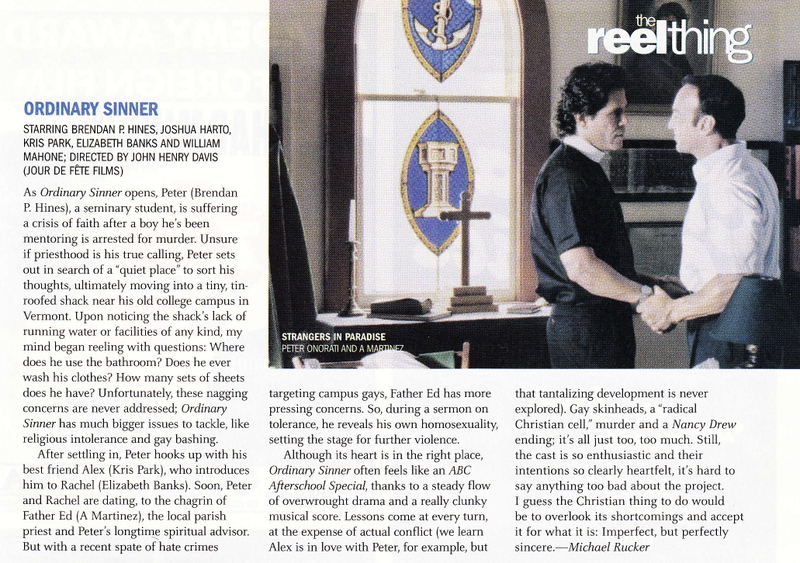 As Ordinary Sinner opens, Peter (Brendan P. Hines), a seminary student, is suffering a crisis of faith after a boy he’s been mentoring is arrested for murder. Unsure if priesthood is his true calling, Peter sets out in search of a “quiet place” to sort his thoughts, ultimately moving into a tiny, tin-roofed shack near his old college campus in Vermont. Upon noticing the shack’s lack of running water or facilities of any kind, my mind began reeling with questions: Where does he use the bathroom? Does he ever wash his clothes? How many sets of sheets does he have? Unfortunately, these nagging concerns are never addressed; Ordinary Sinner has much bigger issues to tackle, like religious intolerance and gay bashing. After settling in, Peter hooks up with his best friend Alex (Kris Park), who introduces him to Rachel (Elizabeth Banks). Soon, Peter and Rachel are dating, to the chagrin of Father Ed (A Martinez), the local parish priest and Peter’s longtime spiritual advisor. But with a recent spate of hate crimes targeting campus gays, Father Ed has more pressing concerns. So, during a sermon on tolerance, he reveals his own homosexuality, setting the stage for further violence. 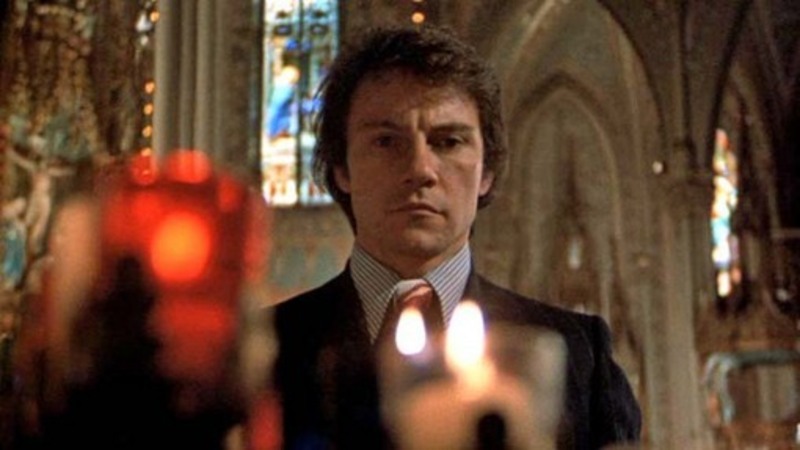 Although its heart is in the right place, Ordinary Sinner often feels like an ABC Afterschool Special, thanks to a steady flow of overwrought drama and a really clunky musical score. Lessons come at every turn, at the expense of actual conflict (we learn Alex is in love with Peter, for example, but that tantalizing development is never explored). Gay skinheads, a “radical Christian cell,” murder and a Nancy Drew ending; it’s all just too, too much. Still, the cast is so enthusiastic and their intentions so clearly heartfelt, it’s hard to say anything bad about the film. I guess the Christian thing to do would be to overlook its shortcomings and accept it for what it is: imperfect, but perfectly sincere.